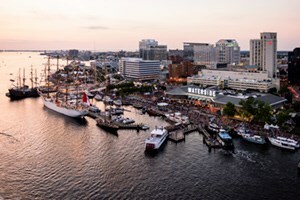 Named the #1 Favorite City in America in 2018 by a well-known travel publication, Norfolk is a city with vibrant entertainment and culture, delicious cuisine and 144 miles of beautiful shoreline. Considered the cultural epicenter of the region, the city is home to the renowned Chrysler Museum located in the NEON (New Energy of Norfolk) arts district. NEON is full of street art murals and galleries including the D'Art Center, restaurants, a comedy club and more. 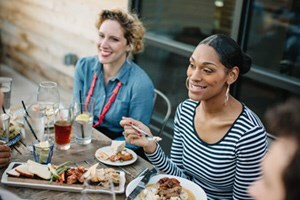 Take a glass blowing class at the Chrysler Glass Studio or nosh on fresh foods at the farmer-owned sustainable eatery, Commune. And speaking of food, Norfolk continues to maintain its reputation as a sizzling culinary destination. Local restaurants stay true to the area by peppering their plates with some of the region's finest ingredients. Chefs pride themselves on using only the freshest seafood and eateries serve up everything from the Lynnhaven oyster, she crab soup and the Chesapeake Bay's star crustacean, blue crabs. Norfolk is surrounded almost entirely by water; the Atlantic Ocean, Chesapeake Bay and the Elizabeth River. Take a sailing class, hop on a Tall Ship harbor cruise or go for a swim in the Bay at Ocean View Beach Park. If you're looking for a unique shopping experience, head over to Selden Market. Selden is an eclectic shopping hall that features local artisans, chefs and new pop-up shops weekly. Explore the MacArthur Center mall, the antique shops in historic Ghent and the new retail outlet mall! 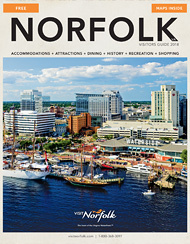 Plan your trip today at visitnorfolk.com !